We are Detroit Cycle Boat! And we are taking the DETROIT ROLLING PUB to a whole new level in Michigan! Whether you call us a BOAT, call us a BIKE, or call us a CYCLE BOAT, one thing you will call us is the BEST TIME EVER! Come aboard the "Detroit Cycle Boat" and experience the Detroit River like never before! Michigan's beautiful summers and amazing waterways provide an exciting opportunity to enjoy the waters of Michigan! No Boat, No Problem! Perfect get together for all ages with friends, family and co-workers to enjoy a day in Michigan like never before! Detroit Cycle Boat is a private charter. All tours start and finish at Sinbad's Restaurant and Marina in Downtown Detroit! Watch video. Get Excited. Book Ride. We specialize in every type of get together possible. Birthday, Bachelor, Bachelorette, work outing, team building or just looking for something fun to do on the water- we have you covered! If you have any questions please give us a call at 231.286.5257! No more worrying about what to do for that party you need to plan! 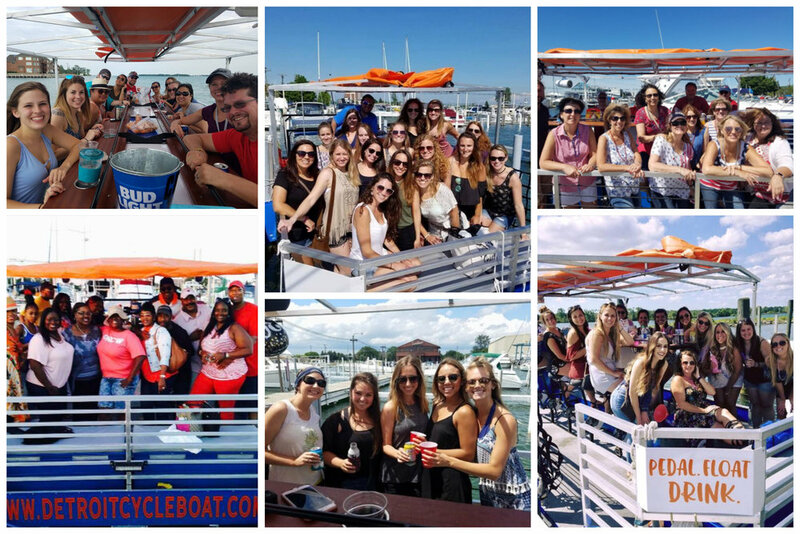 Whether you're throwing a bachelorette party, a bachelor party, or celebrating a birthday party, Detroit Cycle Boat allows you to take the party (and bar) to the water for an unforgettable experience. Looking for a different way to experience Detroit? Grab your friends, drinks and music and we'll show you the best time on the water! Detroit Cycle Boat is the only opportunity to have your own private bar right in the middle of the Detroit River.